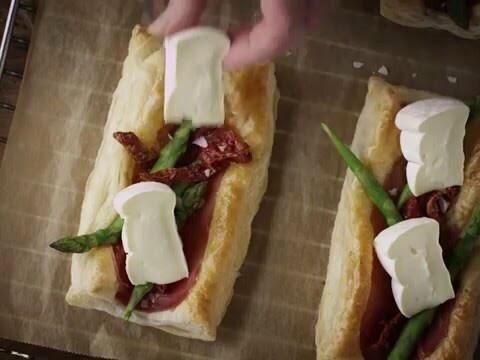 A dish both rustic and elegant - our recipe for Puff Pastry Tart with Asparagus & Prosciutto is an easy shortcut to a good looking, tasty meal. Brittle puff pastry, green asparagus and melted cheese deliver exciting textures while savoury dried tomatoes and cured ham bring deep flavours to the light tart. 2. Thaw the puff pastry on baking parchment for about 20 min. 3. Brush with egg and arrange 1 slice of prosciutto on each sheet of pastry – not all the way to the edge. 4. Bake for approx. 15 minutes until the pastry has puffed up and is golden. 5. Remove from the oven and prick the middle of the dough with a fork to release the air and create a raised edge all the way around. 6. Snap off the ends of the asparagus, then chop them into small pieces and blanch them. 7. Distribute the asparagus and semi-dried tomatoes over the tarts. Bake them for an additional 5 minutes or so. 8. Remove from the oven and arrange the cheese on top of the tarts, then pop them back in the oven for about a minute until the cheese melts. 9. Garnish with fresh basil and serve with a fresh salad.